Droneware is a web based geospatial content management system (GeoCMS) customized for UAV/UAS utilization. The software utilizes drone GPS coordinates at the time the drone’s sensor captures data to allow the information to be retrieved and displayed geospatially on a base map. Hosted in the Amazon cloud, data is safe, secure, backed up and accessible from anywhere in the world anytime. 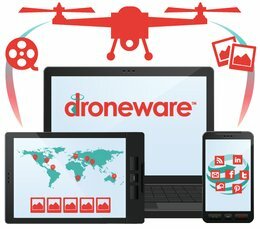 Droneware is simple and easy to use, providing a valuable tool for commercial utilization or for the hobbyist. Droneware builds a catalog of geospatially tagged data resources that can be used for analytics or just plain fun!